If your dog’s having trouble maneuvering on hard surfaces, I think you’re going to learn a lot from their ideas. I know I did. This post contains some affiliate links for which I receive a small fee if you click through and purchase an item. You’re probably thinking this is a ridiculous statement. “My dog slips because he’s old or because he has the beginning stages of paralysis.” But that’s not the whole story. For that, we have to look at how your dog’s paws work. The paws are made up of: the pads, the toes and the nails. Each plays an important role. The pads are thick and designed to cushion your dog when they walk or run. The thickness also protects them from extreme weather conditions by providing insulation to their feet in both cold and hot temperatures. Paws are meant to feel soft, flexible and spongy. But harsh surfaces like snow and ice or walking on the hot pavement in the summer can cause the pads to dry and crack. When the pads are overly dry, they lose the capability to grip the floor in a normal manner. This makes any dog prone to slipping whether or not they have a mobility problem. The beginning stages of paralysis can also contribute to how the pads look and feel. The outer layer of skin on the pads constantly sheds as your dog walks and runs. The process allows new healthy skin to grow in its place. It does it in the same way the skin on our arms and legs sloughs off to make way for new skin. Dogs with early stage paralysis or hind end weakness typically walk less than an able-bodied dog. This interferes with how well the skin can shed. It causes the outer layer of the pad to build up and lose its spongy texture. This in turn makes it more difficult for your dog to walk on a slippery floor. This happened to my dog, Sophie. I found myself having to scrape off the excess skin that didn’t shed on its own. Otherwise she would fall flat on her belly. The problem can be improved by applying an organic paw balm like Paw Tection to the dry pads. It locks in the moisture needed for a better grip. Did you know the toes are of major importance for good traction? Your dog uses them to dig into a slick surface. The toes and nails act like cleats do on a soccer shoe. If your dog’s nails aren’t routinely trimmed or if the hair around the pads grows too long, it interferes with how well they can grab onto a surface. It can cause dogs to fall on their backside or fall on their face with their legs splayed out at every side. Both can cause injuries. Able-bodied dogs compensate for their long nails because their legs and core are strong. But dogs with muscle weakness don’t have that strength. They can’t push themselves up from a slippery floor when they lie down. By keeping their nails short and paw fur trimmed, you can increase their ability to stand up and walk with confidence. Another reason your dog slips on hard surfaces is when their paws knuckle under. This is a common problem in dogs with hind end weakness. Knuckling happens when the top of their paw hits the floor rather than the pad. If your dog is losing the ability to walk, you’re probably familiar with this problem. It’s one of the early signs of paralysis. Dogs knuckle because they lost sensations in their paws and they can’t tell where their paw is in relation to the ground beneath them. If this is happening to your dog, it’s time to be extra vigilant so your pup doesn’t injured themselves. It’s also a time to watch for sores that might develop due to knuckling against a hard surface. Some pet owners turn to a No-Knuckle training sock which is designed to keep the paw in the correct position. Each of these ideas were shared by pet owners who use them for their dogs with mobility problems. Pup Treads can be cut in strips or used for a whole room. Puppy Treads – This clever product is invisible so your guests won’t know you have them on the floor. Puppy Treads are clear anti-slip strips that you peel and stick to wood and tile floors. Place them where your dog falls most or use them to cover a whole room. They’re easy to apply, you just cut a strip or square and press it against the floor. Puppy Treads are soft on the paws and you can clean them with a mop. Carpet Runners – Pet mom Martha uses machine washable and dryable non-skid carpet runners to make a path across all of her tile floors. Her paralyzed pup learned quickly to stay on the runners for a safe journey around the house. Yoga Mat – Jake and his pet mom, Tracey, shared how they use yoga mats to create a safe zone. Tracey likes them because the mats don’t slip and they’re easy to roll up and take with you. At home she lines up yoga mats to make a runner or she puts them side by side for full coverage of a room. And because Tracey and Jake travel, they pack a couple of yoga mats for hotel rooms. Meilocar Dog Rug – If you need lots of coverage in your dog’s favorite room, this floor mat/dog bed comes in sizes up to nearly 5ft wide. It’s a soft, absorbent, non-slip, machine-washable rug that comes in lots of colors to match every room. Meilocar dog rugs will give your dog enough room to spread out and walk around without being boxed in a crate. Bean Bag Chair – I love this idea. It won’t cover a whole room, but it will work wonders if you have a medium to large dog who has trouble getting up off the floor. A bean bag chair is soft and molds to your dog’s body so they can’t fall and hurt themselves. Plus, it’s the perfect height for larger dogs to flop on when they have weak limbs. You should be able to find these at flea markets and garage sales. So, use one or lots of them in a room or spread them around the house. ToeGrips – Pet mom Beth turned to these non-slip nail grips. She liked how they fit onto your dog’s toenails to give a natural approach to walking on slippery surfaces. 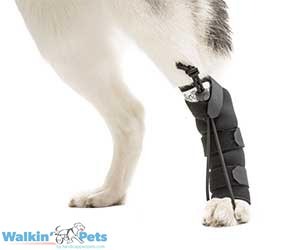 Dr. Buzby’s ToeGrips allows your dog to dig into a hard floor as nature intended. They stay on your dog for about 30 days at a time. Paw Soother – This is an all-natural and organic paw balm to protect your dog’s paws and keep them smooth so they have better traction on wood and tile surfaces. Pup Gear Paw Pads – These are a great option for getting a good grip. They’re ultra-thin pads made from medical grade adhesive that fit over each of the pads on your dog’s paws. Paw Pads are designed to stay on your dog even in moist climates, in the extreme cold and on various surfaces. Woodrow Wear Power Paws – These fashionable grip socks come in lots of different designs and colors. Power Paws are an easy way to protect your dog’s paws and give them extra traction. JAWZ – One of my favorite companies, Walkabout Harnesses, makes these pet booties for indoors. They’re lightweight and designed to help dogs having a hard time getting up off the floor and walking securely without sliding out. JAWZ are easy to put on and can stay on your dog’s paws for hours. JAWZ are available on Amazon and Walkabout Harnesses. PawZ – Pet mom Erika used these rubber boots when her disabled dog was learning to walk again. She turned to them because her dog wasn’t happy with hard dog boots. The rubber balloon material of PawZ gripped well and didn’t hinder her dog at all. Pet mom Missy and Beth also shared their positive experience with PawZ for their dogs. Both owners liked that PawZ are designed to be disposable and tossed out when you’re done using them. Do you have a favorite tip to prevent dogs from slipping on slick floors? Leave it in the comment section and I’ll be happy to share them with readers. This tip came from pet mom Choo after the story posted. Her recommendation to prevent dogs from slipping was so good, I knew I had to include it as an addendum. Choo used it to help her dog grip the hardwood floors in her home while he was recovering from a leg amputation due to osteosarcoma. It was an inexpensive way to give her dog extra traction. Choo used BUTYL drapes/cloth to cover her slick floors. The product is made of cloth on one side and a rubber-like coating on other that adheres to the floor. BUTYL cloth is used most often by painters who need to protect floors while they paint walls and ceilings. You can find them at any paint supply store. They come in a runner size and full room sizes and cost $20-$40. I know lots of pet families will appreciate this tip. Thank you so much for the article on how to prevent your dog from slipping. This is a tremendous help all in one concise place. I’m going to look into several of these solutions for Logan so that he doesn’t slip on the laminate floor in our addition. Logan walks well, but we don’t want him to re- injure his back (disc repaired 2/2018) now that he runs and often slips and slides on the slick floors. Once again, you’ve hit a home run for paralyzed dogs. Thank you! Linda, I’m glad you found the story helpful for you and Logan. It’s good to hear Logan is doing well. I appreciate your kind words. what wonderful information! I do not yet have a doxie with any disc problems, but I know that can change. I will keep these ideas for future. Thank you! Denise, The tips in the story are great for senior dogs too. Very cool!!! I will definitely have to try this! Thank you for sharing, keep up the awesome posts!